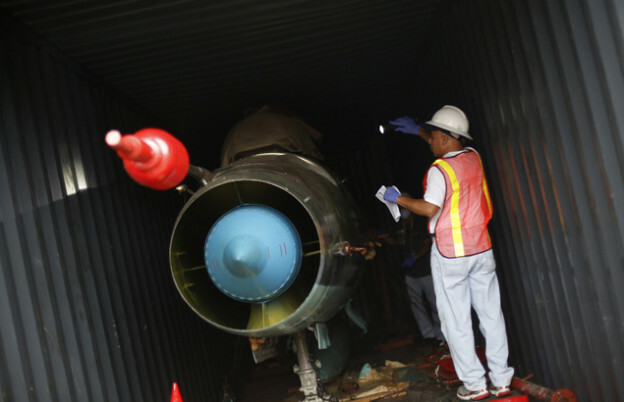 Panamanian officials have found two 1950s era MiG-21 fighters onboard a North Korean ship detained last week after authorities detained the ship after an initial discovery of components of a surface-to-air missile system originating from Cuba, government officials said on Sunday. According to a statement last week from Cuba, the communist country had sent, “240 metric tons of obsolete defensive weapons – two anti-aircraft missile complexes Volga and Pechora, nine missiles in parts and spares, two MiG-21bis [fighter aircraft] and 15 motors for this type of airplane, all of it manufactured in the mid-twentieth century – to be repaired and returned to Cuba,” read a Friday report from Jane’s Defence Weekly. Panamanian officials initially found parts from a SNR-75 ‘Fan Song’ fire-control radar, part of the S-75 Volga-M surface-to-air missile system hidden under 10,000 tons of sugar Cuba had initially marked as humanitarian aid to North Korea. “One can’t take undeclared weapons through the Panama Canal below other cargo,” President of Panama Ricardo Martinelli, told reporters on Sunday. Cuba has asked for the ship to be released. Panama has asked the U.N. Security Council to investigate the ship to see if the contents violate the prohibitions on supplying North Korea with material that could aid in its nuclear or ballistic missile systems. According to press reports, U.N. inspectors are scheduled to arrive in August to inspect the ship and its cargo. Javier Caraballo, head anti-drug official, said authorities have not found any material on the ship that was not included on the list of weapon systems provided by the Cuban government. The North Korean ship, merchant vessel Chong Chon Gang, had previously been detained in 2010 by authorities in Ukraine for smuggling drugs and other contraband according to a report in The Wall Street Journal. Cuba and North Korea have called for the release of the ship’s captain — who attempted suicide before he was captured — and the 35 member crew currently being held by local authorities.